I need my photography time to centre myself and to feel fulfilled. Some use exercise, meditation or chats with friends ....I use photography. I hope that intro did not get you down because it is meant to encourage you to get out there and explore the world around you. As many of you know I love capturing Singapore's historic neighbourhoods. I love their backstreet treasures, the glorious shophouses, groovy shops and fabulous coffee!! Yet Singapore is HOT and HUMID!! I don't like being in the heat for too long ( my camera is heavy!!) and I am not a great fan of public transport ( getting better with this one) or taxis( will never like them). I get motion sick very easily and I am a control freak. Hence I like driving myself! In order to maximise my chances of getting great shots and to sweat as little as possible, I have developed a little routine that usually feeds both of my addictions - street photography and coffee. I take myself on small but productive outings whenever I have a spare hour or so. I no longer go on very long walks and I don't aim to cover one area in one visit. I go back many times and explore different parts. I will research the area on Google the night before and I look at images online. I will have some shots in mind but usually some even better ones pop up. I plan where to park, which streets to visit and I get my gear ready on the day before. I set myself a time at which I will be finishing. Usually 10 am as the light gets too harsh after that and SG temperatures rise quickly. I then go home and put all of my images onto the computer straight away. I will catalogue them in Lightroom ( amazing Adobe software) and then edit only the best ones. I delete anything that is not good enough. You have to cull straight away or you will never get to it again! This little routine works well and doesn't take up too much time. These are my favourite destinations which always cheer me up! It has it all - A gorgeous temple, a relaxed atmosphere, low rise original art deco house, great backstreets, quirky shops, great coffee and easy parking! Even a book vending machine! It is such a treasure box over on the east side. Obviously I love the shophouses in Koon Seng Road. They are still my best selling prints on canvas, on paper, big or small. They have enchanted many of my clients and the prints have truly gone all over the world. Sometimes I wish I could visit all the places where they have gone to! Yet there is so much more to Joo Chiat. One hour of walking around the areas adjacent to these rows of shophouses will yield so many shots that will make a fabulous collage depicting many quirky aspects of Singapore. Head for the back alleys and along the main road. Lots of fab photos opportunities await you! That's why this is still one of my most popular locations for photography outings with students. My kind of neighbourhood! 6 months ago I opened my gallery at 16 A Haji Lane. Yet I have loved this area for quiet some time before that rather serious business decision. This would have to be one of the most colourful, grungy, arty and also culturally rich areas of Singapore. Stress levels always drop for people who walk around the area. They can enjoy quirky " totally not Orchard" kind of shops, street art, a fantastic meal or an excellent coffee. It has an amazing energy every day of the week. Photography in this area is equally delightful. From the stunning Sultan mosque to the hip Haji Lane. There is so much to shoot. The street art attracts many tourists and locals alike. If you do come and explore this area pls drop in and say Hi! The first time I visited this area I went to the ANZA office on Kampong Bahru Road. To be honest I was not impressed by the many Karaoke bars and never ventured further. Yet people kept on mentioning this area to me as my street photography developed. So I explored the wonderful residential areas located behind the main street. I was so pleasantly surprised. Everton Road and Blair Road are simply gorgeous. 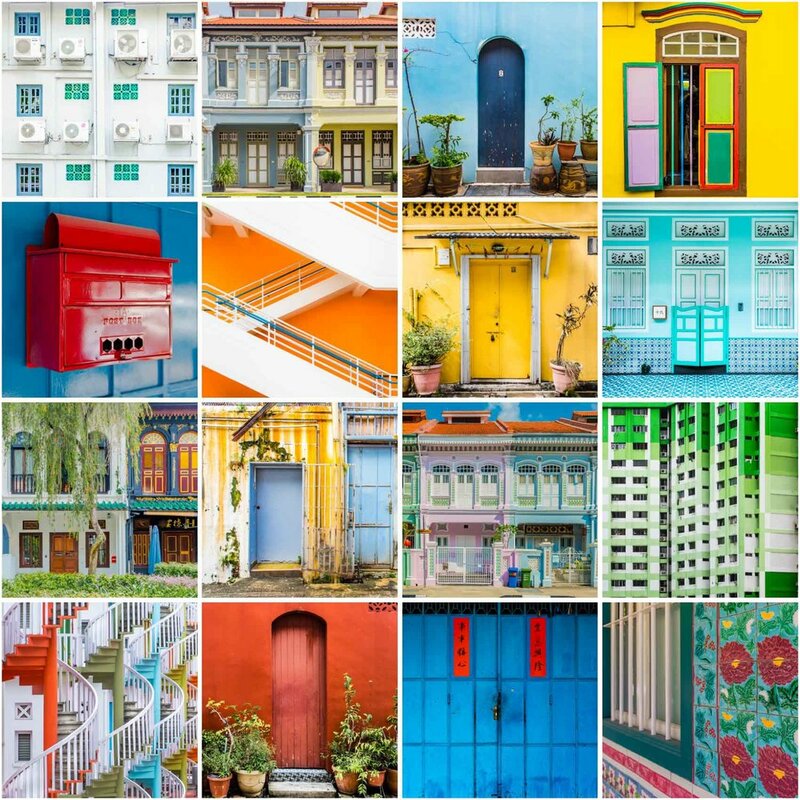 If you like shophouses, cute doors and beautiful house entrances then you have to visit this area. You will love it! Plus you get to see Yip Yew Chong 's first mural "Amah" in Everton Road. This mural led me to get in touch with YC and we have met and chatted on line a few times. We are both a bit nostalgic :) He is an amazing man and you should all look him up and visit his murals! 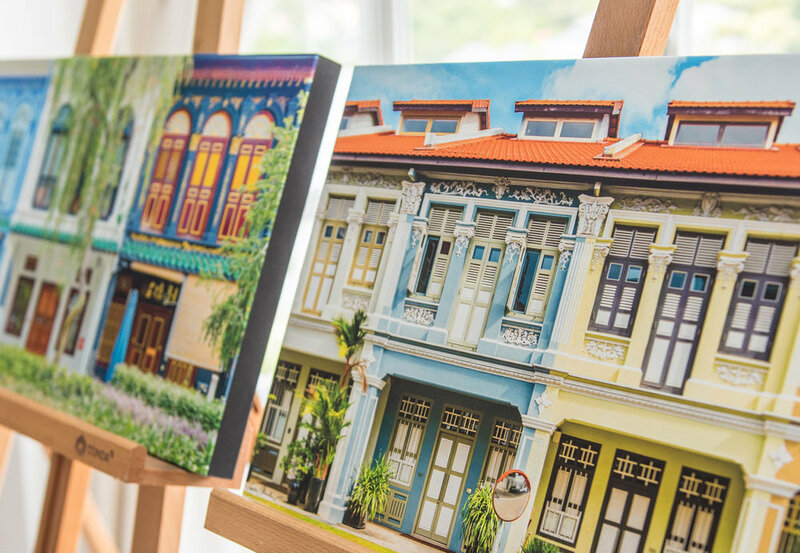 Last but certainly not least is this Peranakan gem of a neighbourhood just off Orchard Road. There is a nice write up for this neighbourhood and conservation area on Wikipedia. Here is the link Emerald Hill. It is hard to believe that this area was once a nutmeg plantation! This neighbourhood is quite small so it can easily be explored on foot before an exciting day of shopping on Orchard Road. I mention this area to so many of the tourists who come to my gallery as it is conveniently located and a great way for anyone to see some Peranakan heritage buildings. If you head up to level 11 of Orchard Gateway you can get a bird's eye view of it as well. In the evening the restaurants and pub near Orchard Road are very popular with locals and visitors alike. A fun and relaxed area at all times of the day. Well there you are. A quick spin around the historical and gorgeous parts of Singapore that make this city so special and will give you great photos. I hope you will also explore them. Let me know if you do!